Sometimes when I'm making a prop, or costume I like it to tell a story. In this case, I really do want it to say ANH so I will tone down the weathered look a bit more. I'm trying to get a more realistic battle worn look as apposed to a hunk of rubber. I am building to centurion, so I'll do my best to meet expectations. Thanks for the feedback, it is greatly appreciated. So I think I may not be looking at screws it may be where pins were placed in the scope. I thought the 2 screws (pins) placed close to the front lens in this picture didn't look right.I repainted the scope as suggested. Better, worse? let me know thanks. I think the light may also be putting a shine on the black because it is so bright and until I seal the paint matte that will happen. So I have been receiving lots of parts for my build, I decided to go with a rubber blaster from Praetorian. The quality is nice but I decided to weather and paint it myself. I still have some touch-up that I need to do on it. I would like to replace the small screws on the scope with real ones does anyone know the correct screw type and size? I also plan to put lenses in the scope, and numbers on the counter I am unsure of the correct script for them. any feedback on the paint is most welcome, please let me know what I need to do to make it look more accurate. Can anyone recomend a good source for a holster that is screen accurate? Thanks, I was so into researching the forums that I had forgotten to look at the CRL. I tend to get sucked into the details when trying to build things. I am having trouble identifying the color of the canvas belt part of the belt. Does it need to be white or an off white color? In some cases it looks bright white in others off white or cream colored. I am trying to build to centurion please let me know. Thanks for answering all of my questions I try to find as much as I can in forums before asking. I am trying to find a E-11 kit. I have looked in the forums it seems that doopy doos is the only kit available that is centurion buildable. I would like to add electronics to it. I have seen that resin cast like doopy doos are more fragile. The only other option I have seen for a blaster is praetorian and I believe it is solid rubber. Does anyone know of a well made kit I can get in the States? I did see the metal kit on Ebay, but it doesn't seem like it would be fun to troop with because of its weight. Nice, congrats on your kit! I hope you have fun with assembly . I'll keep an eye out for your build. Hello everyone, After going back and forth between ANH and ESB and a lot of reading. I have decided on ANH stunt build. I would like to build to centurion. I finally had a chance to unpack the BBB. The AM kit looks great and the build quality seems very sturdy. I am still in the process of ordering and sourcing hardware and soft goods as well as an E-11. I think my only choice for boots is Imperial boots unless someone has another suggestion. I also need to get TD brackets and screws. I can't seem to find the size I need for Chicago screws for the holster. Should I wait to make the canvas belt until I have the torso of the armor built for correct measurements or is it a standard size? I have read many posts on gloves are these ok for centurion approval https://www.amazon.com/Rothco-Gi-Type-Flight-Gloves/dp/B000IH8CDM/ref=mp_s_a_1_2?crid=1M9RGCM3CSYBX&keywords=nomex+gloves+black&qid=1553309003&s=gateway&sprefix=nomex+gloves+bl&sr=8-2 or do they need to be rubber? Some of the discussions I saw that troopers use nomex for breathability. I will start on the bucket first because it seems pretty straight forward. Because of my lack of experience with ABS. I am going to wait and see if there is an armor party locally in the near future, to get help with fitment and trimming of the armor so I know it's correct before I start cutting. Thank you all for the warm welcome and encouragement!! A question I have is where do I get boots. TK boots no longer sells them and Imperial boots has a big closed sign on the sight. Mostly the boots I have found have a seam on the front. It looks like I may have to buy black Chelsea and dye them. Any suggestions would be greatly appreciated. Hello, my name is Matt I have always loved everything Star Wars hooked from the time I saw ESB in the theater. I have been making my own costumes for a while now and I'm pretty good with eva foam. 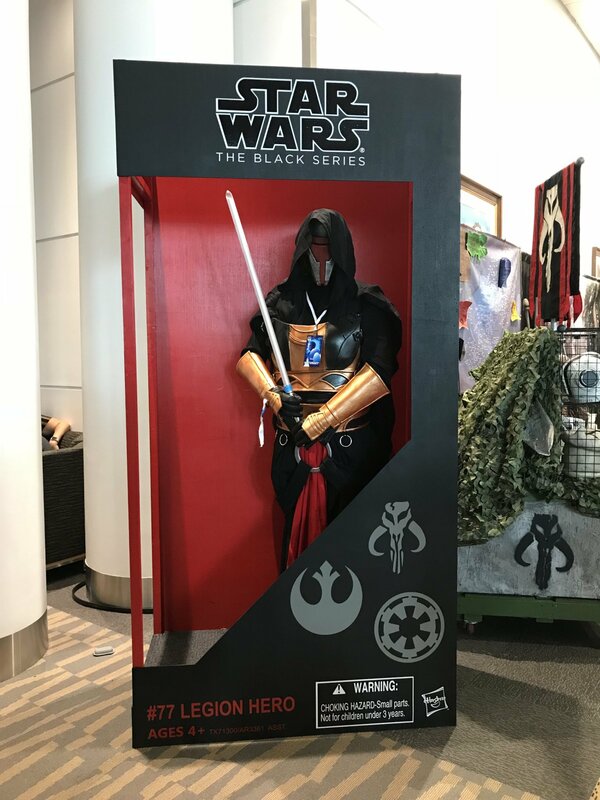 Last year I went to Denver Comic Con as Darth Revan and made my son a set of excicutioner armor. I saw the 501st at their booth. They were all a great bunch of people. In my conversation with them I found that eva is not acceptable as a build material in a costume. Since then I looked deeper into the 501st and I am very impressed with all that you have done for charity. That is what I want to do put smiles on faces and help people visit a galaxy far far away. 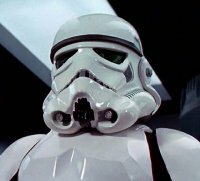 Early in the year I started reading the FISD forums I have always liked the Empire's characters especially stormtroopers. So last week I ordered my first real Stormtrooper armor and recieved my BBB from AM armor Friday. I am excited about the build but a bit nervous about working with the ABS plastic. I will to start my WIP soon.